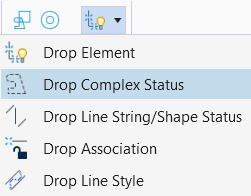 The Drop Element tool icon in MicroStation CONNECT ribbon (Drawing -> Home -> Groups) has been expanded to offer specific drop tools without having to toggle on/off multiple checkboxes in the tool settings window. Selecting the down arrow next to the Drop Element icon in the ribbon panel will present a drop down list of options. 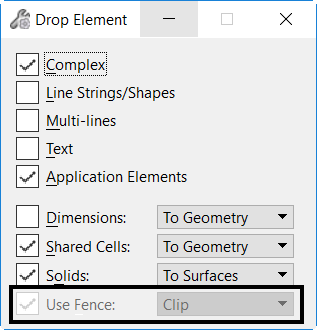 Selecting Drop Element will display the tool settings window with the options available in previous editions of MicroStation, plus a new option to use a fence. Selecting any of the other options suppresses the display of the tool settings window and only the associated option toggle is enabled.